Business entertaining is a fine art. Many a deal have been struck not at an office meeting but in a more relaxed environment like lunch or dinner or on the golf greens. 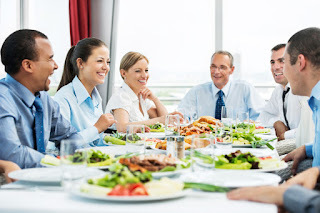 Sharing time with people, over a meal, away from the office environment can help build a more personal relationship and cement your working relationships. 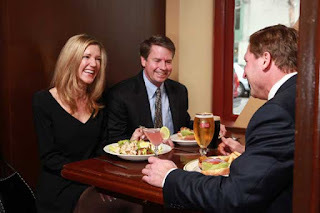 Hosting a business lunch or dinner should be a pleasant experience. With a little bit of planning, you can ensure that the meal is a success. Here are some tips you can follow to ensure that your business lunch is remembered for all the right reasons. Send formal invites. Sending out invites well in time will ensure that your guests are available to attend. An invite sent a week or ten days in advance is preferable. Ensure that you remind the guests a day prior to the event. The invite should give directions to the venue as well as the dress code. It is all about the guest. Keep the preferences of the guests in mind when selecting the restaurant. Ask beforehand if any of the guests have any specific restrictions or allergies and preferences like vegetarian or vegan food to avoid any issues later. Visit the venue beforehand. It is a good idea to visit the restaurant beforehand to make sure that they can cater to your needs. You may want to choose a table and reserve it – one that affords privacy. Guests should feel comfortable about talking business without being overheard. You may want to issue any specific instructions in advance. Seating arrangements. The position of honor is always to the right of the host. The second highest-ranking guest sits to your left. The third honored guest sits to the right of your first honored guest. Gender does not play a role in determining a seat of honor while rank does. It is not about the food. This is the most important thing to keep in mind. Food that requires too much attention to be eaten or becomes messy while eating should be avoided. Nobody wants to have to dig into a huge plate full of food and have to stop talking. Order small non messy dishes which will not interfere with the conversation. It’s not about the drink either. The worst thing to do is to become inebriated during a business meet. Stay very sober so you can focus on the discussion and not lose control. While entertaining international visitors, study their social norms. Even inadvertently violating cultural taboos can cause great offence. Hence it is best to keep in mind the cultural variations with respect to greetings and eating time. For example while hugging is an acceptable form of greeting for anyone from Latin America, bowing is the best greeting for your guests from Japan. Americans and Europeans have early evening dinner time. Says Vineet Thakar, Vice President at an MNC, "Business lunches are more about furthering the relationship. I have observed that many executives keep their cell phones on the table and take their calls at the table itself. It is important that you keep the phone on silent and accept only the calls that are important after you excuse yourself. Responding to every call, texting or messaging conveys a message to the others at the table that they are less important than the person on the phone." Do share your experiences and views. Great tips. Keep sharing such a useful post.